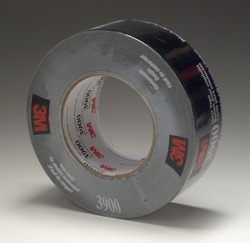 3M™ Multi-Purpose Duct Tape 3900 has a polyethylene backing that resists moisture prolonging the tape bond in moist or humid environments. The rubber adhesive sticks well to many surfaces. It is a versatile tape for many applications. 3M™ Multi-Purpose Duct Tape 3900 is a general purpose, conformable cloth duct tape made with polyethylene film over cloth scrim and rubber adhesive. A good choice for general maintenance, wrapping, sealing, protecting and color coding. Conformable and tears easily by hand. Available in seven colors for color coding. Tested according to UL 723, ASTM E84. Sealing, holding, bundling, reinforcing, identifying, tabbing, wrapping, splicing and protecting.